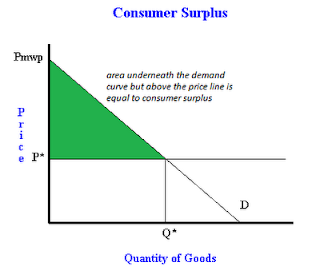 What is consumer surplus, and how to calculate it. - FreeEconHelp.com, Learning Economics... Solved! Home example law of demand microeconomics surplus What is consumer surplus, and how to calculate it. What is consumer surplus, and how to calculate it. This post was updated in August of 2018 to include more information and new examples. Consumer surplus is when a consumer derives more benefit (in terms of monetary value) from a good or service than the price they pay to consume it. Technically, this is the difference between your maximum willingness to pay for an item and the market price. For example, imagine you are going to an Electronics store to buy a new flat panel TV. Before you go to the store, you decide to yourself that you are not going to pay more than $300 for a TV. This $300 is your maximum willingness to pay for the TV. After entering the store, you find a TV you really like for only $100! Since you were willing to pay $300 for the TV, and you only ended up paying $100 for it, you have saved $200. This $200 is called consumer surplus by economists, because it is the “extra” or “surplus” value you received from the good beyond the price you paid for it. 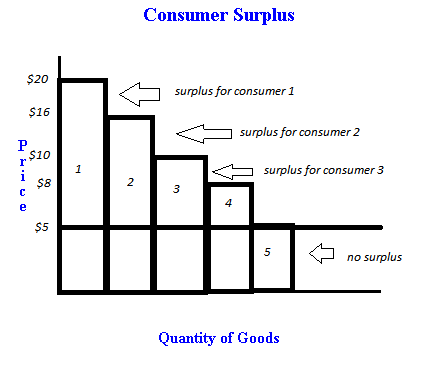 But figuring out an individual’s surplus isn’t the whole story when considering consumer surplus. 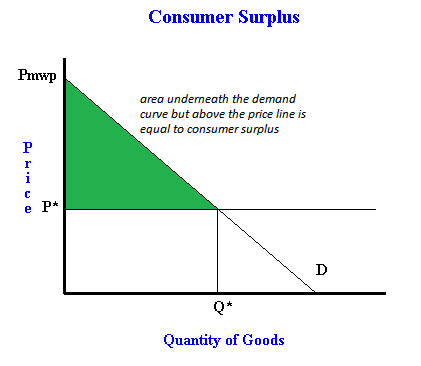 We want to figure out the total amount of surplus for all consumers in the economy and derive the total consumer surplus. An easy way to visualize is shown to the right. In this mini economy we have 5 consumers, and we line them up left to right by their willingness to pay (consumer 1 is willing to pay more than consumer 2, etc.). You can see that each consumer pays the same price for the good, so their surplus is calculated as the difference between their willingness to pay, and the actual amount they have to pay. For the first consumer, he is willing to pay $20, but only has to pay $5, so he gets a surplus of $15. The next consumer is willing to pay $16, but only has to pay $5, so he gets a surplus of $11. 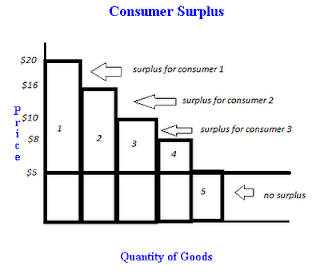 Using the same logic, the third, fourth, and fifth consumers have surplus values equal to $5, $3, and $0 (because their maximum willingness to pay is equal to the price, so consumer surplus is zero). To get total consumer surplus we add these values up, so $15+$11+$5+$3=$34. The total consumer surplus in this economy is $34. This is a good intuitive example of calculating consumer surplus discretely, but in reality most graphs won’t look like this. You will typically be given a linear demand curve so let’s do another example. In the graph below you will see a typical demand curve with a price line intersecting it. This price will occur at P* and will intersect the demand curve at Q* (which give us equilibrium price and quantity). Because this point is at equilibrium, Q* is the quantity of goods that will be purchased from the market, and consumers will pay a price of P*. We will use this information to calculate consumer surplus for this graph. Remember that consumer surplus is equal to the difference between a consumer’s maximum willingness to pay and the price that they do have to pay. Since the demand curve is above the price at points to the left of Q* each of these purchases results in surplus. When P* intersects the demand curve, there is no surplus, and to the right of Q* consumers are not willing to pay the price. Based on the graphical example, we would have to calculate the area of a triangle which is equal to ½(base*height). In our example, the base is equal to Q*, and the height is equal to Pmwp (maximum willingness to pay price) minus P* (actual price paid). This gives us ½((Pmwp-P*)XQ*)). Remember the consumer surplus formula: 1/2(base*height). To get the base, find equilibrium quantity (Q*). To get the height, find the difference between the maximum willingness to pay (where demand intercepts the price axis) and market price. Hello, Thank you for this explanation on consumer surplus. The first chart of the individual consumers is extremely helpful in understanding this concept. I did have one question though. When we look at the Demand Curve, why don't we just add up the individual prices that consumers are willing to pay above the equilibrium price? Why do we have to calculate the area of the triangle? Thanks! @Akshay, essentially that it what we are doing by calculating the area of the triangle. Imagine if there were 300,000,000 consumers, calculating the surplus for each one would be tedious, but calculating the area of the triangle approaches this value and is much easier. This is similar to a Riemann sum vs. an integral for those with calculus. I have found both P and Q. However from this information they want me to find the economic surplus? How can I do that? According to me,,consumer surplus will be 80..
@Anonymous, if you have p&q(Qd=Qs), then you only have to find the maximum willingness to pay i.e. the price at which demand approaches zero. When asked---- the total consumer surplus is shown by area? Do you give the 3 points of the triangle orthe 4 letters that would form a rectangle? How to find out quantity of goods?? If demand curve is q=50-2p and price is 5 then consumer surplus is 400 by area of triangle method and 480 by integration method, why so ?